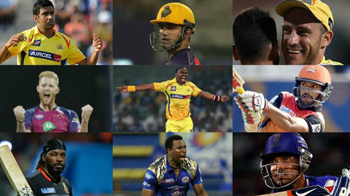 New Delhi, Dec 5: A total of 1003 players have registered themselves for the 70 spots available in the eight IPL franchises for the upcoming mini-auction of the 12th edition of Indian Premier League on December 18 in Jaipur. While the newest addition are players from the Northeastern states, Uttarakhand and Bihar, there will also be 232 overseas players, who have thrown their hat in the ring. There are 800 uncapped players with 746 being Indians. Among the foreign players, 35 Australians have registered themselves while 27 players are from Afghanistan. The highest number of players registered -- 59 -- are from South Africa while USA, Hong Kong and Ireland have one player each in the initial list. Hugh Edmeades, described as an independent fine art, classic car and charity auctioneer, will be the new gavel master. With over 30 years of experience at auction company Christie's, Edmeades will be replacing Madley, whose absence from this edition has not been specified in the BCCI release.